Join our First Challenge in 2018! Hello my crafty friends! Happy New Year! As you know, I am a Design Team member for Magnolia-licious and I have been crafting like crazy over the holiday break. Our first challenge of the new year starts today! Come on over and submit your masterpiece for a chance to win a great prize! My Challenge card for this month is a New Year’s card with 2018 calendar. This image is “Happy 2017 Tilda” from the Aspen Collection. You can order this image right now–and it is on sale–at Magnolia-licious! I made an easel card with black card stock and used My Mind’s Eye, Lost and Found Two, Sunshine Two of Us glitter paper. Each of the calendars are perforated so they can be ripped off each month. Tilda is colored with colored pencils and the flowers are from Wild Orchid. The lucky recipient can set this card on their desk all year long. Don’t forget to stop by and submit your art work. 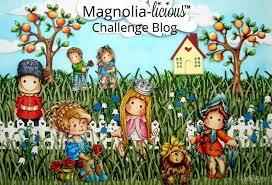 You need to use either a Magnolia stamp image or die cut. What a fantastic idea, Karen. Beautifully made. I love the sentiment you have put on your Calendar!! This is so cute! I like the color pencil technique used. Happy New Year! Thank you so much Pam. I appreciate all your support.